Poland does not use the euro as its currency. However, under the terms of their Treaty of Accession with the European Union, all new Member States "shall participate in the Economic and Monetary Union from the date of accession as a Member State with a derogation", which means that Poland is obliged to eventually replace its currency, the złoty, with the euro. There is no target date for Polish euro adoption, and no fixed date for when the country will join ERM-II (the fifth euro convergence criterion). The country's former Deputy Prime Minister Janusz Piechociński has stated that Poland will not join the Euro until at least 2020. Euro adoption will require the approval of at least two thirds of the Sejm to make a constitutional amendment changing the official currency from the złoty to the euro. The ruling Law and Justice Party opposes euro adoption. Former PM Donald Tusk has said that he may agree to a referendum on euro participation in order to gain their support for a constitutional amendment. 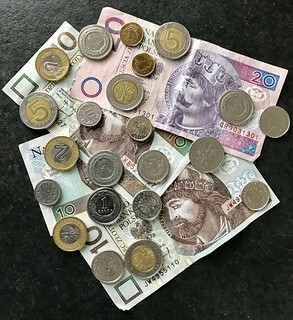 Public opinion is against participation according to polls, with more than 70 percent believing that adoption of the euro would be bad for the Polish economy according to one poll from September 2012. There is not yet any official information on the design process for the Polish national sides of the euro coins. The 20 Polish Złotych note is a denomination of the Polish złoty.